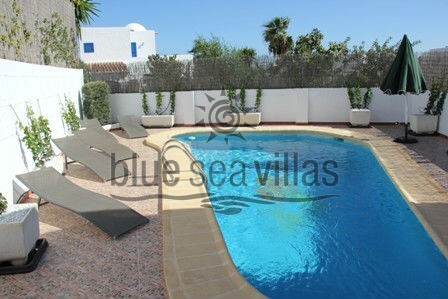 A stunning 4-bedroom detached villa with private pool finished to a beautiful, contemporary standard, situated in a peaceful position on Mojacar playa just 100 metres from beautiful beaches. Casa Vendeval is a luxury villa that boasts four bedrooms, two lounges, a separate dining area, 3 spacious bathrooms and a variety of spacious, sunny outdoor spaces. It has air-conditioning throughout and Wi-fi. A gated entrance leads to the walled driveway with parking for two cars. Steps lead up to the front door of this fabulous modern villa. 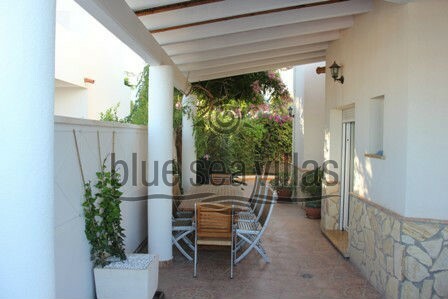 At the front of the property is a covered terrace with a lovely outdoor dining area, a BBQ and sea views. This is the start of the wrap-around terrace that encompasses the villa and leads round to the attractive private pool area, complete with sun loungers. 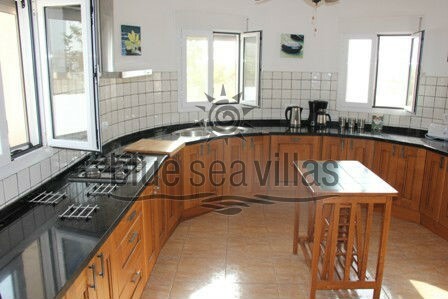 The entrance to the villa leads into the dining area and through to the huge, beautifully fitted kitchen. 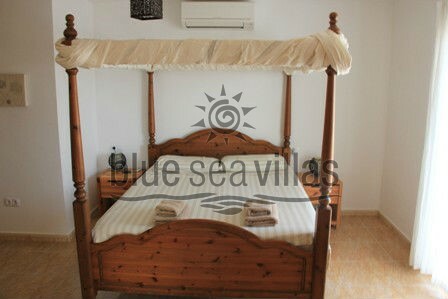 Quality wooden units are finished with a stylish granite top and there are several windows with views to the pool and sea. 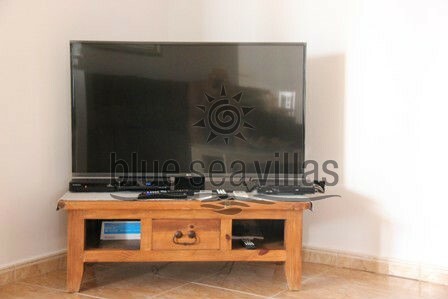 There is a large American-style fridge, hob and oven, dishwasher, microwave, kettle, coffee maker, toaster etc. 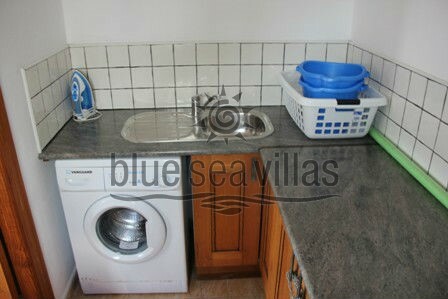 There is also a separate utility room with a washing machine, iron/ironing board and a door opening out to the side terrace and the pool area. The dining area seats six and has lovely sea views. 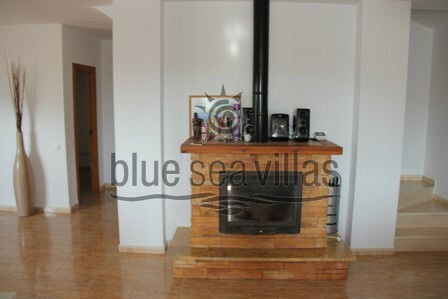 It leads through to the huge lounge where the central focus is an attractive stone fireplace. There are two large sofas on the left side of the lounge where the 50-inch flat screen TV can be found, along with English TV, Spanish TV and a DVD player. 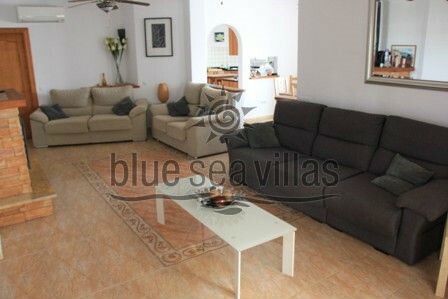 On the right side of the lounge is a third sofa – a quieter spot for reading or relaxing. Double doors lead out onto the terrace. 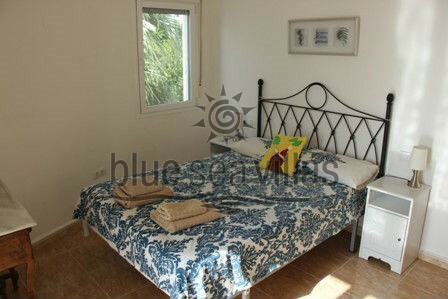 All of the bedrooms in this property are attractive, bright and beautifully finished. 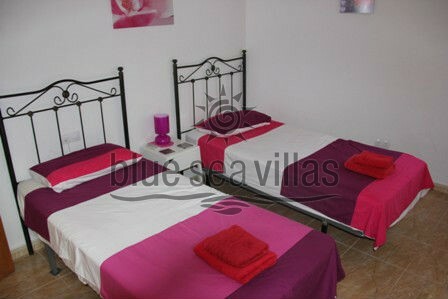 The ground floor has a pretty twin bedroom and a stylish double bedroom. There is also a bathroom with a shower on this floor. 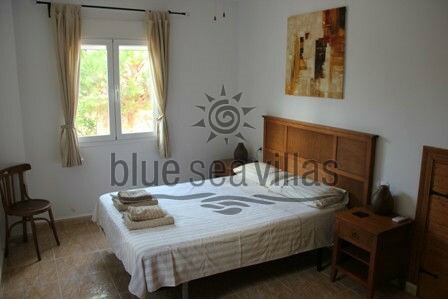 The first floor has a bright and airy double bedroom with patio doors opening onto a small balcony with sea views. There is a bathroom with a bath/shower. There is also find a second lounge area on the first floor with a TV, a sofa and an office area. 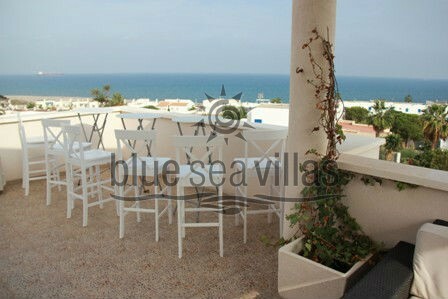 There are also patio doors leading out onto a sunny first floor terrace with fabulous sea views. The second lounge area leads through to the beautiful master suite, complete with a four-poster King-size bed, a spacious en suite with bath/shower and patio doors leading out onto the sunny first floor terrace. 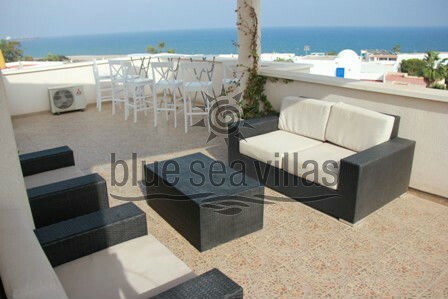 The terrace has sun loungers and amazing views. Carry on up to the top floor where you will find access to a wonderful rooftop terrace with 360-degree panoramic views of the Mediterranean, beaches, mountains and up to the old town of Mojacar Pueblo. There is a shaded area with a table and chairs set – the perfect spot to enjoy an evening glass of wine and admire Mojacar’s famous sunsets. 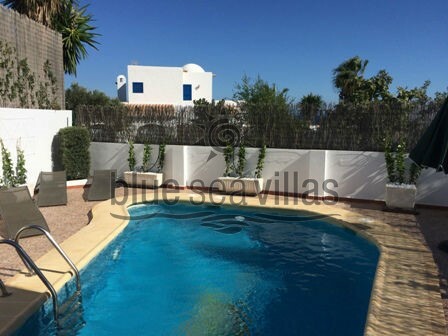 This is a fabulous villa in a quiet location on Mojacar Playa and yet is still only a short stroll to beautiful beaches, bars and restaurants.